Hot on the heels of the Androids, Cell makes his debut in the DBZ TCG this February! 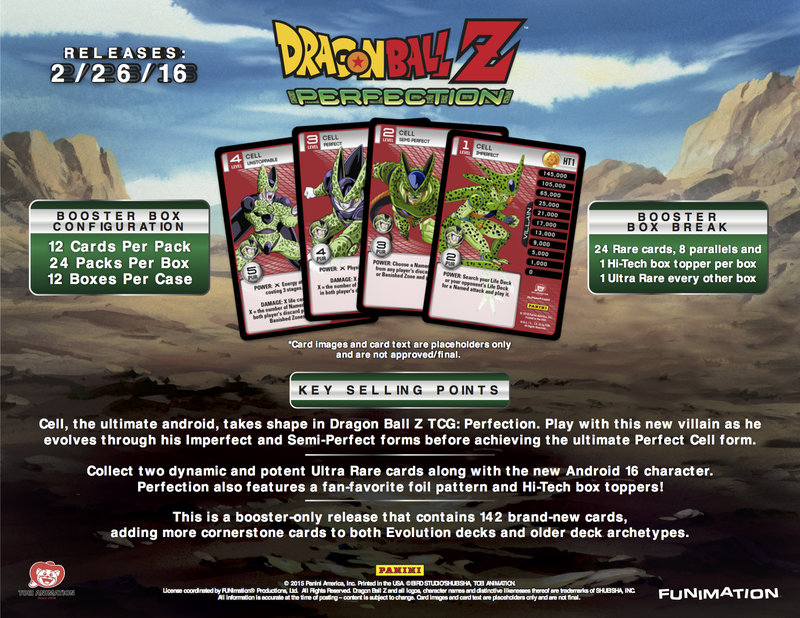 Dragon Ball Z: Perfection is the next expansion for the DBZ TCG, and it hits store shelves on February 26th. Fans of the DBZ CCG will recognize the new foil pattern, and the templates have been slightly revamped with feedback taken into account. The set will contain the usual expansion ratios, with 142 new cards, 4 MPs, and 2 new Ultra Rares (one of which is designed by Gen-Con Champion Phil McGrath). You can look forward to a handful of Named cards for legacy characters, and a few more “Android” cards to boot! Primarily, the Styled cardpool will flesh out interactions with the recently released Mastery cards from Evolution. Much like his mysterious arrival, Cell will be obtainable through new distribution methods. As a special promotion, one random level of a Hi-Tech Cell personality will be included in every box! These “box-topper” Cell cards will feature art similar to the image below. Beyond that, special 7 star “Dragon Rare” foil versions of Cell will be available in booster packs. The pack version of Cell is sure to be a highly collectible item, dropping at rate of [REDACTED]. How is the box toppers going to work with buying from a card shop? Does the store get to keep it or does the first person to buy one pack get it? Once a box is opened, the store will most likely determine how they want to distribute that card. If you are planning on buying a full box, just make sure that it is sealed or that it has the box topper included. Though details are scarce as far as how rare dragon rare is…if it is overly so I will be very unhappy. One of the things that really turned me off of the older DBZ was how some personalities were not readily available to people who did not want to or could not throw heaps of money. Please do not walk this path if that is the current intention. I do enjoy the box topper idea however, built in prize support. I’m calling it now, “entirely unexpected” MP is going to be Mr. Satan (aka Hercule). Heroes… With Gohan a negatory I can only think of outliers like King Kai, Kami, maybe a hero version of 18? Just to clarify, are Cell’s personality levels also included in the set at the normal Common/Uncommon rarities, or are the HTs and Dragon Rares the only prints of Cell? At this time, they will only be available as box toppers and as Dragon Rares. Nice. I like that. Finding Dragon Rare Cell levels will be really cool! I hope the foil pattern is from Cell Games, that was my favorite in the old game. Although I believe the Android Saga was hinted at previously, so I’m figuring it’ll probably be that. As for Cell’s 7-star pull rate, in Evolution we had a 4 in 30 chance of pulling a level of a personality’s pack foil per ‘pack foil spot’, and 3 ‘spots’ a box, so about 40% chance a box, or an expected number of boxes to pull one level at 2.5 boxes. Assuming Cell’s pack foil is around the same rate, I’d guess it’ll be like a level 1-4 of his pack foil per case, equivalent to a UR in Set 1. As for the unexpected MP…Chaozu? Seems like there’s always jokes about him dying, so probably totally unexpected to introduce him in the battle against Cell. Also super psyched for Cell. i am betting all my chips the unexpected MP is yajirobe. Who expects the great samurai who saved everyone in the saiyan saga. He, who brought the gift of the senzue bean to the Z fighters when they needed it the most. The Bean daddy is coming. I ve waited a looooooong time for cell!!!! He was my first personality I ever got in the old score game. Prior to that I built my deck from boosters and trading. I just hope it won’t be a complete headache to get a play set of Cell. I had been wondering what style he would cater to, but it looks like Black style. What cards have been shown yet if any? I haven’t seen them and very curious. Also anyone have a guess as to how much Cell is gonna cost for a set? And if his named cards are gonna be ultra rare? Lol sorry I’m super excited for this set and saving!! !